Less than 10 important winter checks that you can do. One major hazard with winter driving is that the sun sets earlier in the day, which means there's less daylight, especially on your commute home. As a result, you'll want to do everything you possibly can to make sure all of your vehicle's lights are in excellent shape, providing the brightest possible illumination they can. If a bulb is out, fix it before winter starts, and if there's snow covering any exterior light, make sure you remove it before setting off to drive anywhere. If your headlights are foggy or yellow, consider replacing them or look into an easy restoration kit. It's often more difficult for a battery to operate in cold weather than it is for a battery to operate in warm weather. As a result, a battery that's merely weak during the summer could turn into a dead battery during the winter. Our advice is to have a volt test performed on your battery before winter starts to make sure it's still in good working order. If it isn't, buy a new battery as soon as possible so you'll never have to worry about being stranded or left in a cold parking lot with a car that won't start. Coolant, also known as antifreeze, is tremendously important to your car, as it keeps the engine from freezing in cold temperatures. Before you head into winter, make sure your car isn't low on coolant and that there aren't any leaks in your vehicle's engine that could cause coolant to drain out. Many mechanics recommend drivers use a 50/50-mix of coolant and water in their radiators, which usually results in a lower engine freezing point than just coolant. You might be wondering what gasoline and washer fluid could possibly have in common. The answer is that they're two automotive items you should try to keep full during the winter. You should try to keep your gas tank full for several reasons, like the fact that a full tank may prevent accumulated water from freezing inside your fuel pump and can help you stay warm by allowing the engine to stay running in case you get stuck. Meanwhile, a full windshield-washer reservoir is tremendously important, as messy road debris from a snowstorm can sometimes necessitate constant window washing to see where you're going. "All-wheel drive is confidence-inspiring when you're accelerating, but it doesn't help you when you're braking and turning," says Woody Rogers, director of product information for Tire Rack. 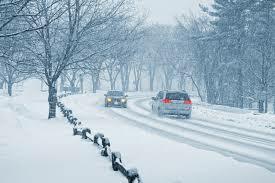 "Winter tires are a must in areas where the temperature regularly drops below 45 degrees," Rogers adds, noting that winter tires are more capable of staying flexible at low temperatures. This means that they can provide improved traction when you're trying to stop and turn on cold pavement, even if there's no snow on the ground. It's incredibly important to keep track of your tire pressure as temperatures get colder. This is because tire pressure can drop along with the air temperature, losing up to one pound per square inch with every 10-degree drop in air temperature. Driving around with low tire pressure could mean premature tire wear or potential tread separation, which could lead to a major accident. Also, your car handles less predictably with underinflated tires. If you check your tire pressure and find that one or more of your tires are low on air, fill them at a gas station air pump and don't forget to let out a little air as temperatures start to climb again in the spring. Before winter gets into full swing, be sure to check your car's window defroster and its climate control system to make sure both items are still working properly. Their purpose is obvious: The climate control system will help keep you warm in the winter (and can help keep your windows from fogging up), while the defroster will keep your windows from icing up. Both items are crucial to maintaining comfort and safety throughout the winter. Although this isn't a car care tip as much as a winter preparedness tip, we suggest considering a survival kit for your vehicle if you want to really maximize your vehicle's readiness for winter. While it might sound ridiculous for some urban drivers, motorists in rural areas might find themselves stuck on a deserted road with heavy snow falling and few vehicles around for miles. If there's even some possibility you'll end up on a road like this during the winter, a survival kit is a good idea. Select one that's stocked with a blanket, a first-aid kit, a knife, a flashlight, jumper cables and a cellphone charger that works in your vehicle's cigarette lighter. We also suggest keeping a shovel in your vehicle's trunk and some sort of de-icer spray handy, so you can easily access the engine or trunk in case they're frozen shut.